← Why does my hand hurt? Just off my computer and straight to you is the very first video of many for Christmas 2013. Introducing the Noel Square. This square is part of a larger afghan by Red Heart called the Granny Noel Throw. Due to difficulties in trying to film the entire project. Assembly of this afghan didn’t go as planned and is frankly too difficult to follow along. This project would be the time I would need to be in a production studio with camera and producer on hand to go through the steps to be sure it’s captured properly. Though I had filmed it in its entirety, the video footage is difficult for someone like me who actually filmed it. 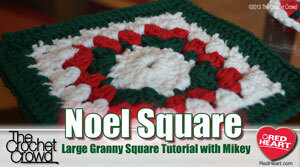 You can get the free pattern and instructions at my website, It’s called the Noel Granny Square Throw. The smaller square and assembly of those 4 squares will also be provided in a new tutorial coming up. This entry was posted in Christmas, Tutorial Videos and tagged Afghan, Afghans, Christmas, crochet crowd, Free Pattern, Granny Square, Holiday, Mikey, Noel Granny Square Throw, Noel Square, Red Heart, Throw. Bookmark the permalink.